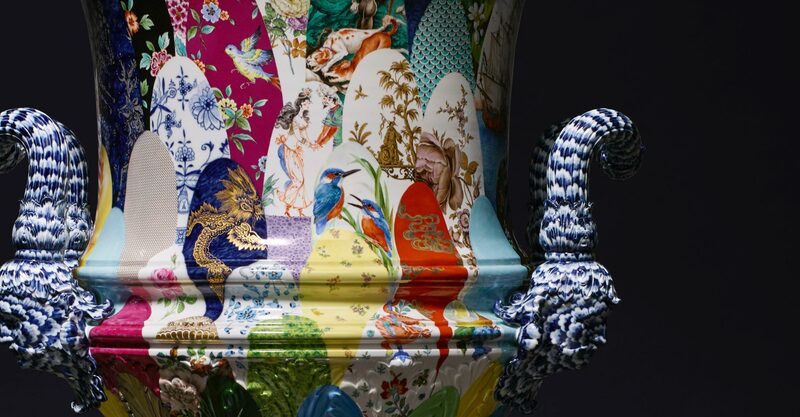 The rich variety of designs and colours that decorate Meissen porcelain is unsurpassed anywhere in the world. 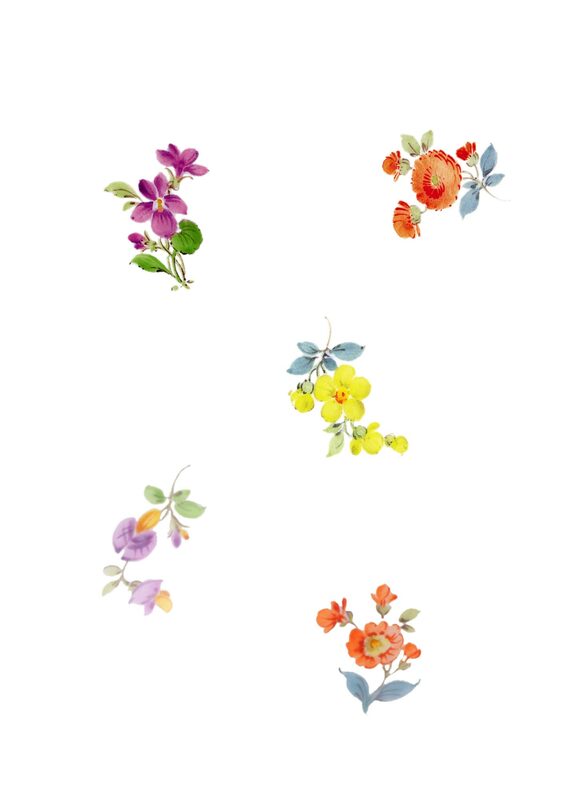 From the chinoiserie of Johann Gregorius Höroldt and the nearly 300-year-old “Onion Pattern” or “Ming Dragon” to the delicate blossoms of the Biedermeier-era Manierblumen (“mannered flowers”), all the way to innovative, contemporary creations such as the “Stripes” or “Cosmopolitan” collections – the breadth of Meissen decor embodies the artisanal excellence and design traditions of Europe’s oldest porcelain manufactory over the centuries. To this day, each step of decoration is applied by hand using traditional techniques, relying entirely on proprietary over- and underglaze colours made from pigments formulated in the in-house laboratory that was first founded in 1720. In the early days of the laboratory, it was porcelain painter Johann Gregorius Höroldt who advanced the development of colours, creating a base palette of 16 coloured, kiln-resistant overglazes and a cobalt-blue underglaze that laid the cornerstone for the manufactory’s decorative tradition. During his time, hundreds of decoration motifs were created of such artistic calibre and radiant colour that they blazed a trail for all the European porcelain that followed. Today, the standard repertoire of a Meissen porcelain painter comprises around 300 colours – a small portion of the approximately 10.000 paint formulas conserved in the laboratory. The exact formulas are accessible only to a small number of employees, valuable as these are to the rich legacy of Europe’s oldest porcelain manufactory. The opulent “Crater Vase” brings together more than 100 historic decors. A masterpiece that, from casting to painting, combines all crafts of the Meissen manufactory. Created in 1739 at the behest of King August III, the iconic “Snowball Blossoms” are among the most outstanding artistic masterpieces of the Meissen porcelain manufactory. For the first time ever, this venerated decor is reinterpreted in relief as part of “Royal Blossom”. The history of the “Onion Pattern” is rooted in the development of Meissen’s blue painting technique and its particular aesthetic effect on porcelain. Immediately after the invention of the first European porcelain and the founding of the manufactory in 1710, the search for a very special blue began – one that would emphasize the unprecedented white of the porcelain while at the same time harmonising with it. The combination of cobalt and oxygen proved to be extremely heat-resistant and optimally suited to the high firing temperatures used for Meissen porcelain. Inspired by East Asian patterns, which were predominantly blue at the time, Meissen’s radiant blue “Onion Pattern” was created in 1731 and would go on to become famous around the world. The pattern’s “onions” are not in fact onions, but rather peaches and melons lining the rim, bamboo stalks and delicate chrysanthemum blossoms in the middle. The “Strewn Flowers” are one of the most beloved decorative motifs of the Meissen manufactory. Created at the start of the 19th century, the design is typical of the Biedermeier era. The impetus was to feature the natural beauty of blossoms and flowers and thus pull away for the first time from archetypal East Asian designs, or “Flowers of the Indies”. As a variant of the “German Flowers” painting style, this Meissen decor exhibits certain unique characteristics. Strewn around a larger central flower are a variety of smaller blossoms, which painters can select from amongst three dozen flower motifs. Each had its own symbolism during the Biedermeier era and was used to express thoughts and sentiments. Painted on the porcelain by hand, the fine detail of the “Strewn Flowers” lends Meissen porcelain a particular vitality and an innate symbolism. With the “Royal Palace” collection, MEISSEN is returning to the roots of its 300-year history: To the Albrechtsburg in Meissen, which served as the production site of the Meissen porcelain manufactory for its first 150 years. The palace’s historic floor mosaics provided the inspiration for the graphic patterns, which feature in pure white, splendid red, noble black, or gleaming turquoise on Meissen porcelain. The design’s delicate contour emphasizes the geometrical modernity of its lavish meander pattern. With “Boettger Stoneware”, MEISSEN honours the legacy of a storied material that played such a fundamental role in the development of Europe’s first porcelains. Both then and now, it is the expressiveness, surface feel and earthen warmth of that original stoneware that captivates its admirers. Sophisticatedly understated, Meissen’s “White” decor variant was created to showcase the radiant lustre for which Meissen porcelain is so renowned; lending table services a festive air. The filigree decor “Mesh White” offers an altogether novel, sensual surface design to elevate the fine material. In 2004, Meissen’s historic “Onion Pattern” received a contemporary makeover, for which the intricate full-plate pattern was reduced to reveal a chrysanthemum winding along the plate’s rim. The vined bamboo shoot with delicate blossoms and leaves along with the original pattern’s double leaf have remained, while the fruits have disappeared altogether. The new pattern presents itself as a lighter, breezier offshoot of the 1731 original, allowing the porcelain’s lustre to shine. On cups, both chrysanthemum and vined bamboo have struck roots in a similarly reduced, less compact artwork – making it seem as though the bamboo were growing straight from the cup. The fruits here have also disappeared, while an “onion” on the saucer harkens back to its historic inspiration. 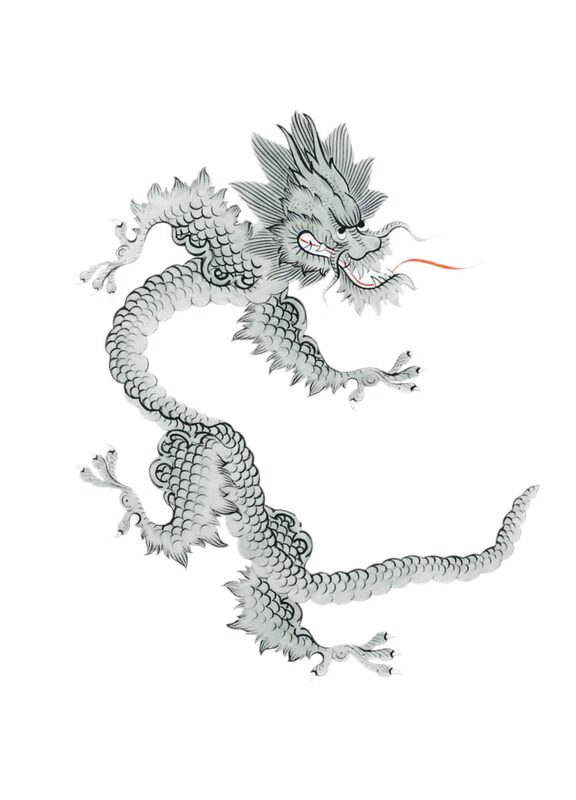 During the Ming Dynasty, the dragons began to appear more frequently on Chinese porcelain. In Chinese mythology, this supernatural creature symbolises not only the spirit of change, but also the rhythm of nature and existential wisdom. 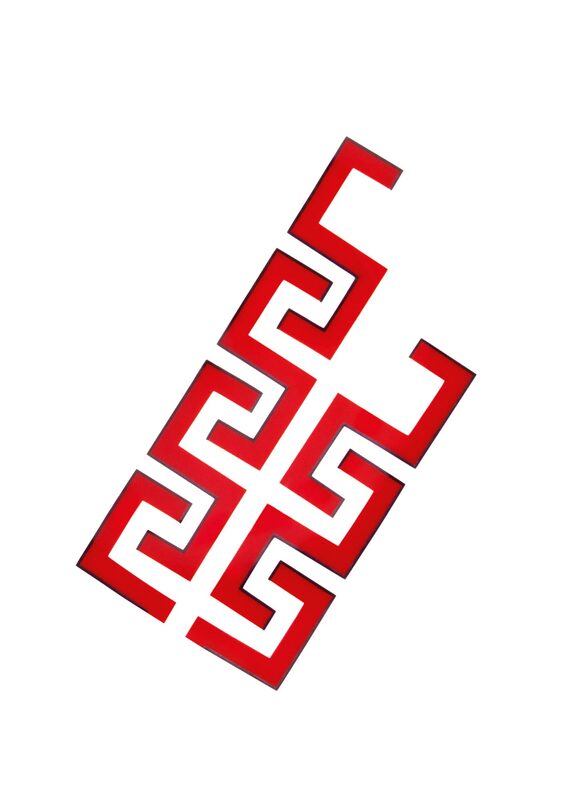 It represents the sun, the light and the male power of yang. Chinese designs also serve as the inspiration for Meissen’s “Ming Dragon” motif. This pattern, which is one of the manufactory’s earliest designs, was created in in 1740. The figure of the dragon with four toes, which is the representation typically used at MEISSEN, was originally reserved exclusively for imperial princes in ancient China. An 18th-century neoclassical pattern design inspired the sun-like rays of the “Stripes” collection. In line with the original designs, a custom colour palette was developed by Meissen’s paint laboratory, lending the service its historic symbolism and radiance. Floral decorations based on botanical drawings, depicting flowers and blossoms in their natural beauty are an important genre within Meissen’s varied decor repertoire, dating all the way back to the 18th century. For this, the manufactory’s painters are not only inspired by nature but also channel the artistic style of their time. On- and under-glaze paints are employed, often in combination, and in a variety of techniques in order to realize their artistic visions on porcelain. A wonderful example of Meissen’s contemporary designs, “Wild Poppy” is inspired by floral aquarelle paintings, capturing the flaming red tones of summer meadows in jaunty brushstrokes. In contrast to its more traditional equivalents, this motif’s beauty lies in its breezy, almost candid composition. Constantly reflecting on one’s own rich artistic heritage is deeply rooted in the Meissen tradition. 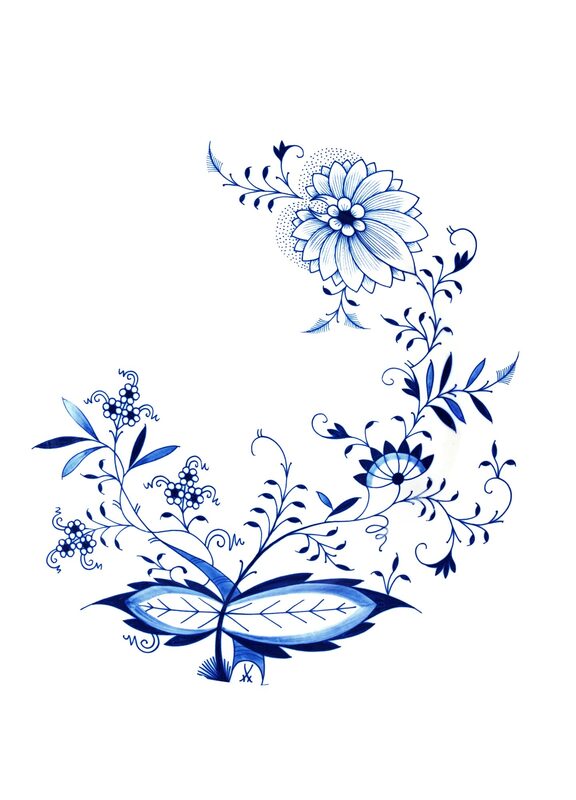 The filigree “Blue Orchid” décor is no exception. It is based on a 1970 design by Professor Heinz Werner: “Blue Orchid on a Branch” is one of the ingenious porcelain painter's most popular motifs. For Meissen’s “Cosmopolitan” collection, one element of Werner’s original is placed in the centre of the elegant “Mesh platinum” pattern, lending the pieces a minimalist feel. 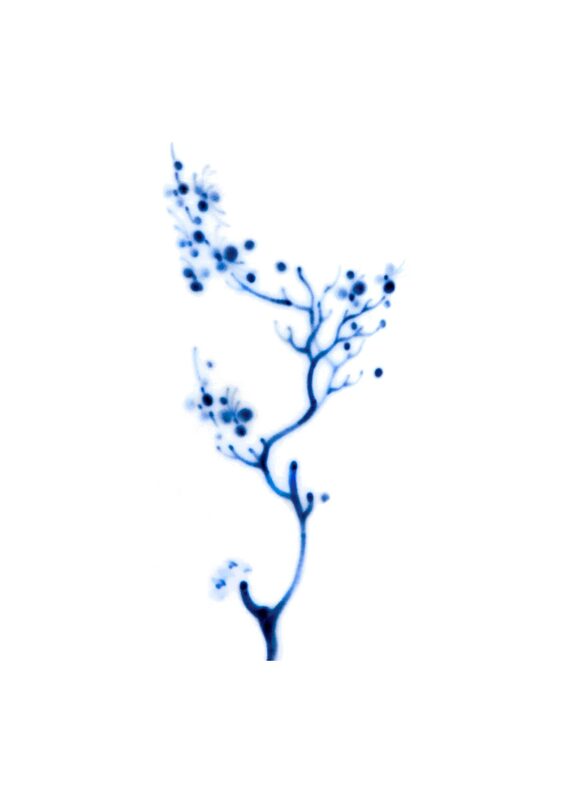 The “Blue Orchid” is created using an elaborate under-glaze painting technique. The paint is applied directly to the unfired, still porous porcelain, allowing it to absorb the colour immediately, and making it impossible to correct any errors. The design’s initial appearance, a matte grey, only attains its characteristic cobalt blue radiance after glazing and in reaction to the subsequent glaze firing. “Swords” is a decorative homage to the Meissen manufactory’s historic signet. 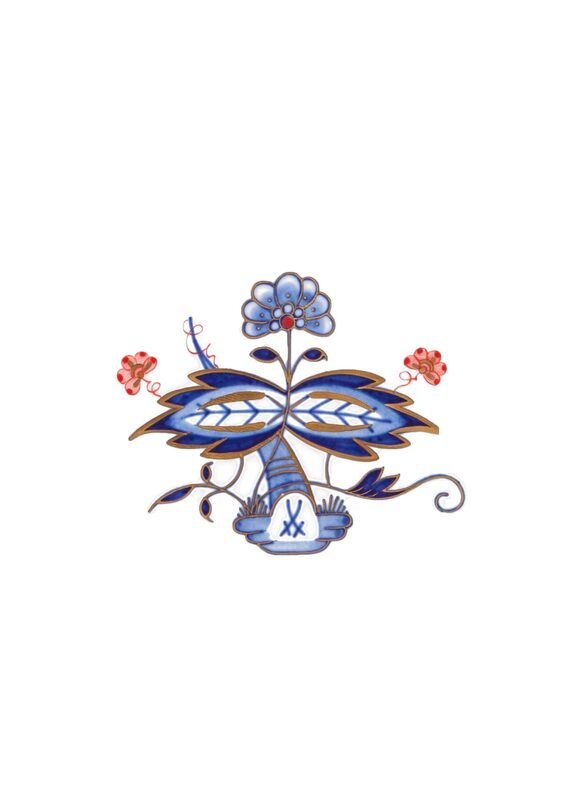 Since 1722, the trademark is applied by hand to every piece of Meissen porcelain in the manufactory’s own cobalt blue by appointed “swordsmen” – painters specialising in the Crossed Swords. Although the swords have evolved slightly over the years, they have always remained instantly recognizable. For the first time in the manufactory’s history, its venerated trademark is boldly reinterpreted as a decorative motif in sleek and understated “Elegant Grey” or an opulent “Luxury Gold” variant. 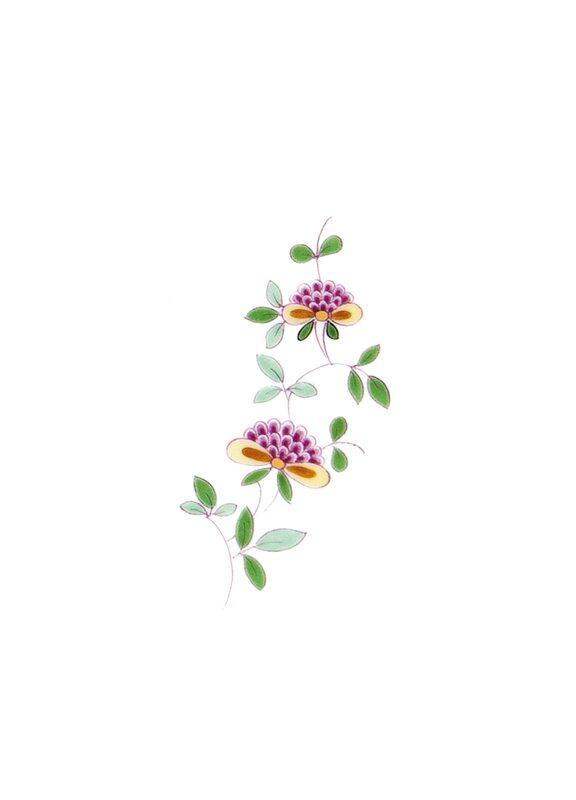 Floral painting on porcelain has a long tradition at the Meissen manufactory that has grown continually throughout the ages and continues on to this day. 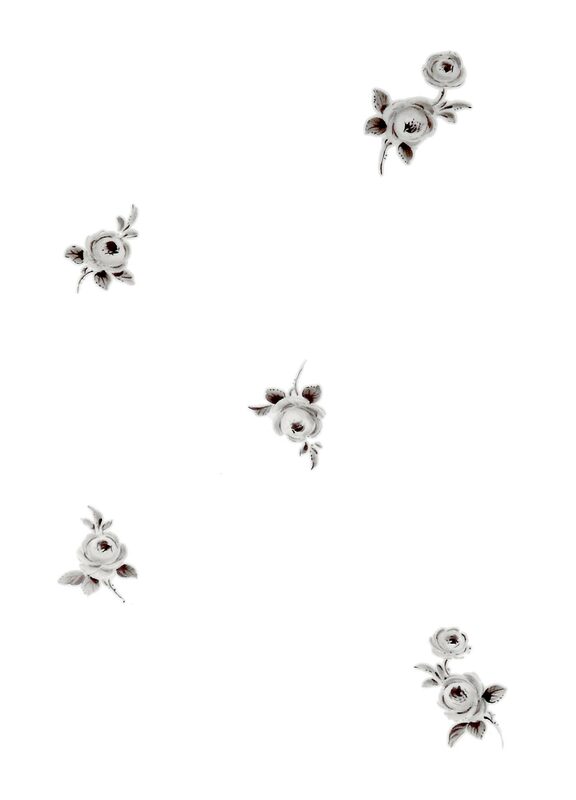 Amongst its many motifs, it is the “Strewn Flowers” that rank among the manufactory’s most popular and iconic. Created between 1815 and 1845, they are typical of the Biedermeier era. 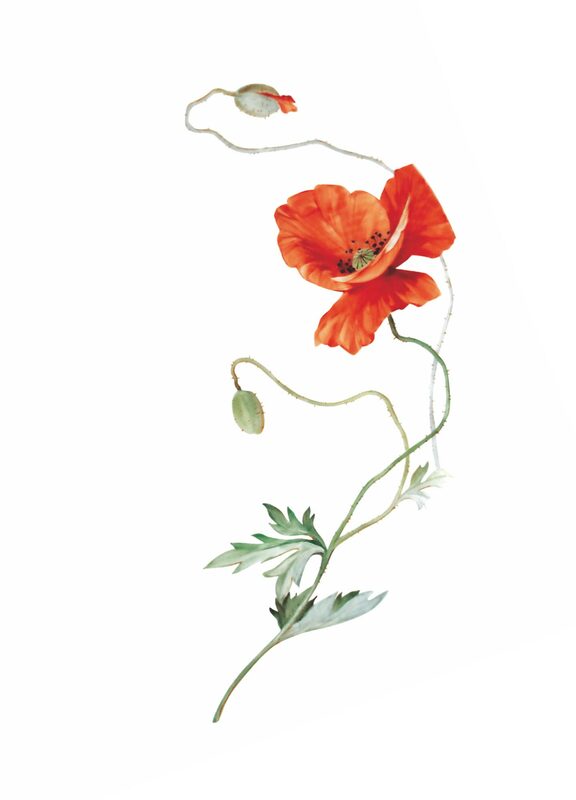 During this period, porcelain painters would use flowers as symbols to express their thoughts and sentiments. As the symbol of everlasting love, roses took on a prominent role amongst all floral motifs. 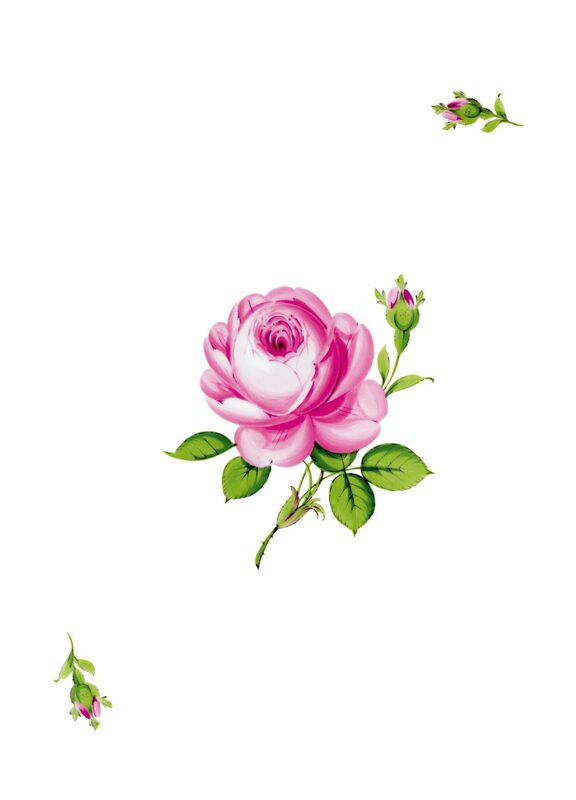 Within the design, a larger central blossom takes centre stage and is surrounded by a variety of smaller roses. Painted on porcelain by hand, the fine details of the “Strewn Roses” testify to the masterly craft of Meissen’s porcelain painters. In its “Gold” decorative style, porcelain is plated with opulent swaths of burnished gold. Matte after leaving the kiln, the decor receives its shine only after polishing it with a sharpened semi-precious stone, an agate stylus. “Mesh Gold” offers a subtle counterpoint to these lavish pieces. As an expressive foundation, platinum, the most precious of all metals, highlights porcelain’s timeless, clear character, while emphasising its radiant white lustre. A true embodiment of subtle elegance, both “Platinum”, and the more reserved “Mesh Platinum” are decors with a unique aura. Upon its founding in 1710, MEISSEN remained the only porcelain manufactory in Europe for nearly a decade. Its most important asset was the formula and techniques required for the manufacture of porcelain. To ensure that these remained confidential, only a few employees were each given a part of the secret. To no avail. From 1718 onwards, a wave of newly founded manufactories required MEISSEN to mark its true originals.  In 1722 came the decisive motion, when Johann Melchior Steinbrück, the first inspector of the manufactory, suggested the use of the Crossed Swords from the coat of arms as a fitting trademark. 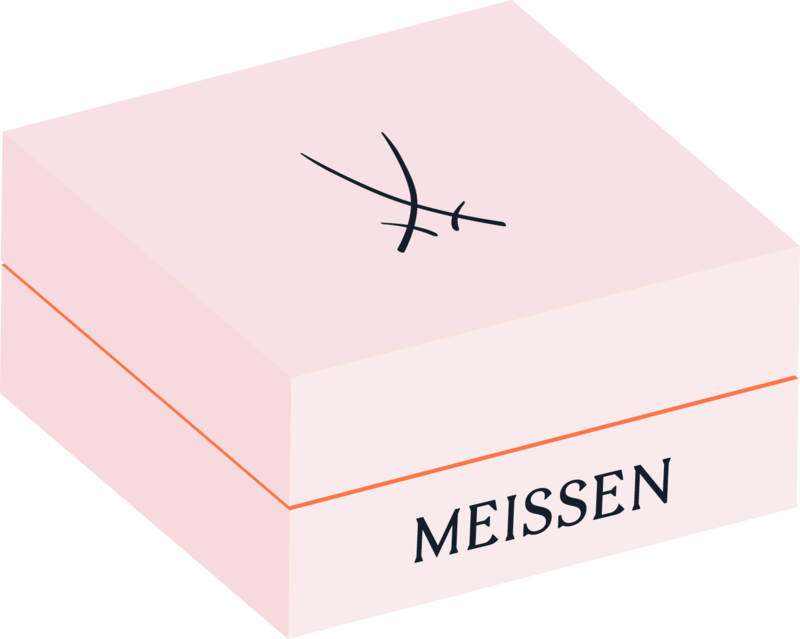 In 1875, the Crossed Swords were registered as the official Meissen trademark, making it the oldest in Europe. Floral painting on porcelain has a long tradition at the Meissen manufactory that has grown continually throughout the ages and continues on to this day. Based on the still life paintings of the Old Masters, roses began to appear as a motif in porcelain painting in 1740. Initially in bouquet form, the rose became popular as a single motif in the following Marcolini period. The graceful “MEISSEN Rose” was developed from these paintings in the Biedermeier period. The design corresponds to the particularly evocative still life paintings of flowers in the style of Georg Friedrich Kersting, a Dresden painter who was head of flower painting at MEISSEN at this time. Although hugely influential on the style in this period, there are no designs that have been proven to be solely created by the artist himself. In “Woodland Flora with Insects”, MEISSEN draws from local pastoral motifs, depicting them in sumptuous brushstrokes. The aquarelle-inspired designs transport the painting style’s flowy forms and pastel colours to Meissen porcelain – their brilliance only being attained in multiple glaze firings. Clear blue skies, turquoise ocean, sun, palm trees, and flamingos: Miami is as colourful as it is vibrant, and the inspiration for Meissen’s “Miami Style” pattern. Bold, specially created porcelain paints such as “Red Sunset” and “Turquoise Sea”, capture the essence of the city’s lifestyle. 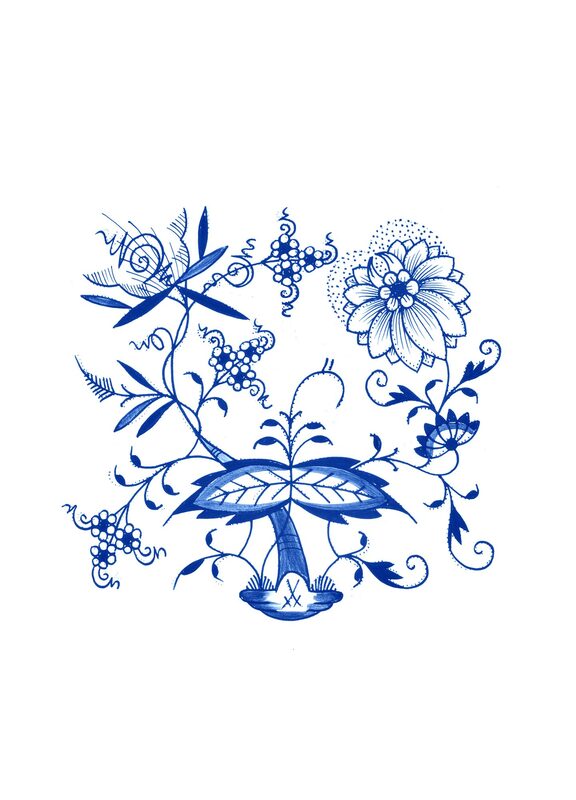 Applied to tableware and vases as far back as 1720, the “Indian Flower Branches” is one of the oldest decorative motifs of the Meissen manufactory. Modelled after East Asian archetypes of “Indian” painting, the floral motif abounds with symbolism. The lotus flower, a token of purity and enlightenment, occupies a prominent position. The pure, unblemished blossom that rises beaming from out of the mud is a symbol whose metaphorical meaning can just as well apply to Meissen porcelain. Inspired by East Asian porcelain, whose decorations were predominantly blue at the time, the world-famous “Onion Pattern”, the most iconic blue pattern in porcelain history, was created by MEISSEN in 1731. In reference to Chinese originals, the “onions” in the pattern are not in fact onions, but rather peaches and melons lining the rim, bamboo stalks and delicate chrysanthemum blossoms in the middle. With “Noble Blue”, Meissen’s “Onion Pattern” takes new shape to contrast the opulence of the original design with modern lightness. Motif details in bright red and filigree gold finishes complement the colour palette of “Noble Blue” and form the perfect contrasting complement to the deep cobalt blue.